Consider this scenario: if you lose a single tooth, the two most common methods of tooth replacement are a tooth supported bridge or an implant supported crown. The American Dental Association (ADA) reports that bridges last an average of 10 years. Clinical studies indicate that implants are over 95% successful for 20+ years. Therefore, a conservative cost breakdown over 20-25 years may look like the chart below. 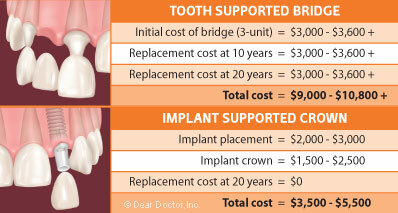 Even with partial insurance reimbursement, the cost of a tooth supported bridge is more expensive long term. The total cost over 20-25 years or more could be significantly higher than shown above. And with an implant supported crown, the adjacent teeth are not compromised so that additional treatment is not necessary. Consider too, the concept of amortization — the process of decreasing or accounting for the cost over the period of time they are likely to last. Implants may seem more expensive initially. But for patients who are candidates, not only are they a better treatment choice, they will last longer, possibly a lifetime, thereby making them the ideal choice and most cost effective option long term. As we shall see in part two when we guide you through the marketing hype, well planned implants most often require a team approach in assessing whether they're right for you. Placing implants and attaching crowns to them require precision procedures and techniques.